What most of us eat is a health disaster! Our food is grown, manufactured, and packaged by large corporations. And guess what? Their goal is to make money, not to provide you with good, safe, healthy food. To maximize profits, they produce food cheaply, food that is highly addictive, loaded with chemicals and calories, while lacking in actual nutrition. As a result, 2/3 of the US population is overweight, and 1/3 would be considered obese. Ten percent of Americans have diabetes, and cancer is on the rise. There is a simple solution. Eat more natural, organic, fresh food: vegetables, fruits, whole grains and nuts. 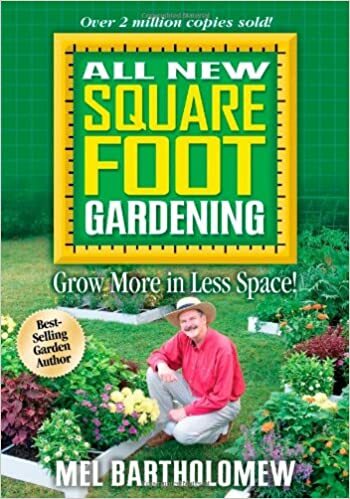 Mel Bartholomew doesn’t talk about all that in his book, All New Square Foot Gardening. What he does talk about is a very easy way to grow your own vegetables in a small space. His methods are radically different from traditional gardening. According to Bartholomew, his method has the following benefits. Square Foot Gardening uses six inch deep raised beds, filled with a mixture of compost, vermiculite, and peat moss. This results in “ideal” soil and avoids the weed seeds that may be in your current soil. Your garden boxes are divided into square feet, with something different in each square. I hadn’t planned to read the whole book, but once started, I didn’t want to put it down. Bartholomew throws in a good deal of humor, along with a lot of information. As to his gardening methods, I was so convinced that I can’t wait until spring to start planting, but I especially look forward to having a fresh, healthy, and delicious dinner growing right outside my back door.